Venezuelan President Hugo Chavez has signed a decree declaring an "electricity emergency" to help his government tackle power shortages. Speaking on his new radio show President Chavez said Venezuela, which depends heavily on hydropower, was facing the worst drought in 100 years. Heavy energy users will get a discount if they cut consumption but face price rises if their usage does not fall. Rolling blackouts are already in force in parts of Venezuela. President Chavez announced on Monday that he had signed a decree authorising Energy Minister Ali Rodriguez to take the necessary measures to guarantee the electricity supply. "The truth is, it's an emergency," he said. Under the decree, which will be in force initially for 60 days, energy users who consume more than 500 kilowatt-hours per month, must reduce their consumption by at least 10% or face a 75% price rise. If they cut consumption between 10% and 20%, they will get a 25% discount on their bill. Industrial users will also have to cut their usage by 20% or face sanctions. Although Venezuela has big oil reserves, it is dependent on hydro-electricity for some 70% of its power. This is generated by the massive Guri Dam complex on the Orinoco River, which has fallen more than 9m (30ft) below normal. "Today it fell another 13cm (5in). It hasn't rained the whole year; it's Venezuela's worst drought in 100 years," Mr Chavez said. The government says the drought coupled with increased demand has stretched resources. Energy and rationing is already in place, except in the capital, Caracas, where the measures were suspended amid protests. Last month Mr Chavez announced that $1bn (£640m) would be invested in the energy sector. Critics say poor management and the failure to invest in infrastructure over the years are to blame, a view rejected by Mr Rodriguez. "It's not due to lack of investment, even if it's true that we've had some problems (and) delays with some projects," he said. 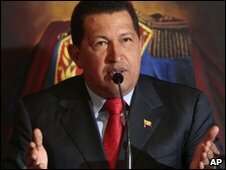 President Chavez's announcement came during the first broadcast of his new radio show, Suddenly with Chavez. He said the programme would always be preceded by the sound of a harp playing folk music. "When you hear the pluck of a harp on the radio, maybe Chavez is coming. It's suddenly, at any time, maybe midnight, maybe early morning."